postponing glaucoma surgery for patients run out of eyedrop options. Reduce systemic side effects, such as dysgeusia (a bitter aftertaste in the mouth), low blood pressure, reduced pulse rate, fatigue and depression which mostly come from beta blockers type of eyedrops while dysgeusia is the biggest complaint of dry eye patients who use Xiidra eyedrops. Our own clinical study shows that Tear Duct Occluder lowered IOP by 2.00 +/- 0.5 mmHg (p<0.001). The patient on the left used to use her finger to press against her tear duct while administering drops but her IOP was still not low enough and she was due for glaucoma surgery. Our clinical study shows only 10% of glaucoma patients practice manual NLO correctly; 14% patients practice manual NLO for less than a minute; 14% patients do not practice manual NLO regularly and 62% do not practice NLO at all. 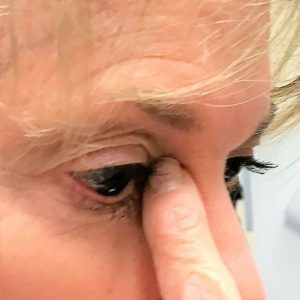 After using Tear Duct Occluder for two months, this patient’s IOP became low enough to postpone her glaucoma surgery indefinitely. Tear Duct Occluder can occlude both tear ducts for you while you are administering eyedrops. It eliminates the burden of pressing the tear duct by hand and give you freedom to do other things. It increases your adherence to practicing Tear Duct Occlusion as your doctor advised and therefore, improves your eye healthcare. You simply wear this device while instilling the eyedrops and continue wearing it for 5 more minutes after the instillation. Repeat this process for additional eyedrops, if any. 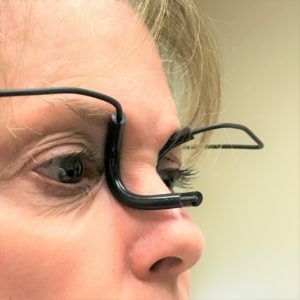 Our clinical data shows that Tear Duct Occluder fits 90% of patients without needing adjustment; 90% of glaucoma patients have high interest on this device; 10% of patients have moderate interest on this device and 10% of all patients do away with surgery. > Keep eyedrope in eyes!